Dear Applicants, Are you Searching for you Teaching Jobs then here is good news for you . University of Rajasthan has released notification for recruiting candidates on 217 Teaching Jobs of Professor, Asst Professor & Other. Interested candidates can fill application form for Rajasthan University Recruitment 2017 from here through online mode. You can fill online form for Rajasthan University assistant professor Jobs on or before the last date 23.06.2017 (extended till 07.07.2017). University of Rajasthan is inviting online application for those candidates who are waiting for Raj University Teaching Jobs. Online registration for Rajasthan University Recruitment of Assistant Professor Jobs has been started from 24.05.2017. This is good job opportunity for all the candidates who are waiting for UNIRAJ Recruitment Notification. For More information about RU Teaching Jobs like Age Limit, Application Fee & Other you can check from given below details. AM I Eligible for Rajasthan University Recruitment 2017 ? What is the required Eligibility Criteria for Rajasthan University Assistant Professor Jobs 2017 ? How I Fill Online Application form Rajasthan University Recruitment 2017 – Uniraj Teaching Jobs Online Form ? What is Salary Structure & Selection Criteria For uniraj.ac.in Jobs 2017 ? Professor & Associate Professor Jobs : Applicants must have done Master’s degree with minimum 55% Marks & Ph.D. in respective subject from any recognized University for Rajasthan University Jobs 2017. Assistant Professor Jobs : Master’s Degree with minimum 55% marks in respective trade from any recognized institute for Raj University Assistant Professor Recruitment 2017. Librarian/ Dy. Librarian/ Asst librarian : Candidates must have done Master’ s Degree in library Science/ Information Science/ Documentation Science or equivalent for this vacancies. Age Criteria For Rajasthan University Teaching Jobs 2017 : Age relaxation for Uniraj Recruitment 2017 is applicable as per Department Norms. Candidates can check required age Criteria for RU Professor Vacancy & Other from official University of Rajasthan notification which is mention below. What is the Cost of Application form for Uniraj Recruitment 2017 ? Candidates of General/ OBC Non Creamy layer Category need to pay Rs. 1000/- & OBC Non Creamy layer/SC/ST category applicants must paid Rs. 500/- for filling Rajasthan University Jobs Online form. PWD Candidates should paid Rs. 100/- for applying application form for RU Assistant Professor recruitment 2017. Professor/ Librarian : Candidates will paid pay band Rs. 37,400/- to 79,000/- + Grade pay Rs. 10,000/- for Uniraj Professor Jobs 2017. Associate Professor/ Dy. Librarian : Rs. 37,400/- to 67,000/- with GP Rs. 9,000/- will paid for this vacancy. Assistant Professor/ Assistant Librarian/ Asst Director : Selected candidates will paid pay band of Rs. 15,600/- to 39,100/- with Grade of Rs. 6,000/- for Rajasthan University Asst Professor Vacancy. 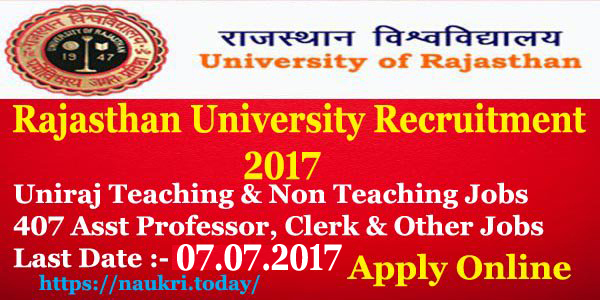 RU Teaching Jobs 2017 Selection Method : Selection of the candidates for Rajasthan University Recruitment of Assistant Professor Jobs 2017 will based on merit list. Merit list will made on the basis of Education qualification, experience & Other Factor. You can check more information about Selection method from Official Uniraj Teaching Jobs Notification. Keep in touch with this page for future updates about Rajasthan University Jobs 2017. First of all candidates log on to the official website www.uniraj.ac.in. Now click on Recruitment Section. Then Click on Respective Rajasthan University Vacancy Notification link. Read all required information in notification properly. Then deposit application fee & click on submit application form. 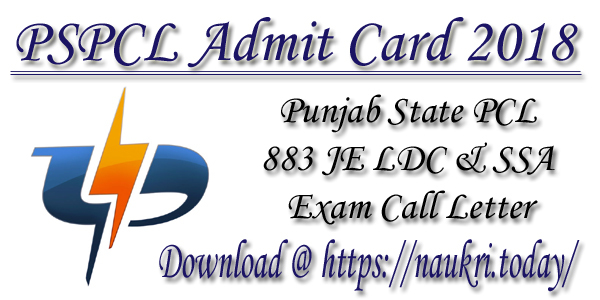 Now send the hard copy of application with required documents on correct postal address. Conclusion: Rajasthan University Recruitment 2017 For 217 professor, Asst Professor & Other Jobs. candidates can fill online form for Uniraj Assistant Professor Jobs on or before the last date 23.06.2017(extended till 07.07.2017). University of Rajasthan is inviting online application for recruiting candidates on Various Non Teaching Vacancies. There are 190 Clerk, Lab Assistant & Other Vacancy. Interested candidates can application form for Rajasthan University Recruitment 2017 through online mode. You may submit the Rajasthan University Clerk Jobs online Form on or before the last date 03.02.2017 (extended till 07.07.2017). Rajasthan University (RU) has released recruitment advertisement for 190 Clerk, Lab Attendant & Other Vacancy. This is great opportunity for all the candidates who are looking for Universit of Rajasthan Jobs. Online registration has been started from 02.01.2017 (24.05.2017). For more information about Rajasthan University Non Teaching Jobs like required age, Qualification etc. you can check the given below details. Fresh Update (23.05.2017) : Dear Applicants here is a news for you that Exam for B.Com Part III which was going to held from 29.05.2017 has canceled. Now the University of Rajasthan will conduct B.Com Part III examination from 12th June 2017. You can check New Examination Schedule from here. 1. Junior Clerk 92 Post Rs. 5,200/- to 20,200/- + GP Rs. 2,400/-. 2. Lab Assistant 23 Post Rs. 5,200/- to 20,200/- + GP Rs. 2,800/-. 3. Lab Bearer 25 Post Rs. 5,200/- to 20,200/- + GP Rs. 2,000/-. 4. Herbarium Assistant 01 Post Rs. 5,200/- to 20,200/- + GP Rs. 2,400/-. 5. Junior Technical Assistant 11 Post Rs. 9,300/- to 34,800/- + GP Rs. 3,600/-. 6. Book Attendant 12 Post Rs. 5,200/- to 20,200/- + GP Rs. 2,000/-. 7. Electrician/Wireman 05 Post Rs. 5,200/- to 20,200/- + GP Rs. 2,400/-. 8. Additional Registrar 01 Post Rs. 15,600/- to 39,100/- + GP Rs. 6,800/-. 9. Controller of examination 01 Post Rs. 15,600/- to 39,100/- + GP Rs. 6,800/-. 10. Deputy registrar 05 Post Rs. 15,600/- to 39,100/- + GP Rs. 6,600/-. 11. Assistant Registrar 10 Post Rs. 15,600/- to 39,100/- + GP Rs. 5,400/-. 12. Legal Assistant 02 Post Rs. 9,300/- to 34,800/- + GP Rs. 4,800/-. 13. Cartographer 01 Post Rs. 9,300/- to 34,800/- + GP Rs. 4,800/-. 14. Manager, University Guest house 01 Post Rs. 9,300/- to 34,800/- + GP Rs. 4,800/-. Rajasthan university Vacancy Age Limit : Age of the candidates for Rajasthan University Recruitment 2017 should be in between 18 tears to 35 years as on 01.07.2017. For Assistant Registrar vacancy upper age must be 40 years. There is no age limit for the regular Employee of University (RU). Relaxation is applicable up to 05 years for SC/ST/PWD/ Women candidates for Uniraj Non Teaching Vacancy 2017. For Post No. 01 to 07 : Candidates should have passed 10+2/ Bachelor’s Degree or equivalent qualification in respective trade from authorized University. For Post No. 08 to 14 : Applicants must have completed Master’ S degree/ LLB/ MBA in respective stream or equivalent qualification for Rajasthan university Non Teaching Vacancy 2017. You can check post wise required qualification details from official Uniraj jobs notification which is given below. 2. SC/ST/BC Cream Layer/ SBC Cream Layer of Rajasthan Rs. 500/-. 3. PWD/ PH Candidates Rs. 100/-. Pay Scale For Rajasthan University Jobs : Selected applicants will be paid pay band For Rajasthan University Vacancy 2017 as per Department rules & regulation. You can check post wise pay grade for www.uniraj.ac.in Vacancy which is mentioned in above table. Rajasthan university Non Teaching Bharti 2017 Selection Criteria : Selection of the candidates for Rajasthan University Recruitment 2017 will be on the basis of Departmental exam Scheme. According that for Post No. 01 to 07 Selection will be made on the basis of Written examination & For Post No. 08 to 14 selection criteria will be Written exam followed by Interview. for more details about Raj university Recruitment keep in touch with page. How I Fill Online Form For Rajasthan University Recruitment 2017/ Raj University Jobs online form ? Candidates log on top the official website www.uniraj.ac.in. After that click on Recruitment Section & Read out Rajasthan University Non Teaching Jobs Notification. Now click on apply Uniraj Jobs Online application link. Make all the information in online form without any error. Then recheck all details before submission. Take print put of application for for future use. Sir exam date kya he? ?